"This cake and its icing are made from scratch. I cook for a living and the people who I have tried this on love it!" Preheat oven to 350 degrees F (175 degrees C). Grease a 10-inch bundt pan. To Make Filling: Beat egg white with 1 teaspoon vanilla until soft mounds form. Add 1/2 cup sugar gradually, beating until stiff peaks form. Stir in coconut and 1 tablespoon flour. Set filling aside. Dissolve the cocoa in the hot coffee. Separate the three eggs, setting the yolks aside. Beat the egg whites until soft mounds form. Gradually beat in 1/2 cup sugar until meringue stands in medium-stiff peaks. Combine the sour cream and the baking soda. Beat remaining 1 1/4 cups of the sugar, shortening, egg yolks, salt, 1 teaspoon vanilla and 1/2 of the of the cocoa mixture until light and creamy, about 4 minutes. Stir in 2 cups flour, the sour cream mixture, and the remaining cocoa mixture; blend well. Fold about 1/3 of the beaten egg whites into the batter to lighten it; gently fold in remaining egg whites. Turn 1/2 of the chocolate batter into the prepared pan. Place 1/2 of the coconut mixture on top. Cover with the remaining chocolate batter, then the remaining coconut mixture. Bake in preheated oven until a tester inserted in the center of the cake comes out clean, 55 to 65 minutes. Let cake cool completely before removing from pan and icing. To Make Icing: Combine 2 cups sugar and 1/4 cup cocoa powder; transfer to a saucepan. Add butter, corn syrup, and milk. Bring to boil over medium heat, stirring frequently, and let boil for 1 minute. Do not overcook! Remove from heat, let cool, and stir in 1 teaspoon vanilla. Beat icing until it is at a soft, spreading consistency; glaze cake. This is a great cake. 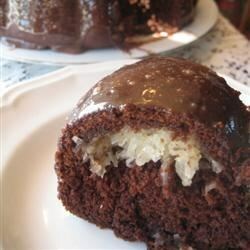 It is similar to the old chocolate macaroon Bundt mix, but it's better. I have gotten rave reviews when I've made this. It's now my husband's favorite cake! My mother started making it for us as a special treat birthday cake every year. My wife makes it for me once a year and for our kid's birthdays. We all love it! thisrecipe was good but I wouldn't make it again. My family thought it was just okay and they want something else.